Undefeated boxer Isaac Macleod has more than just glory driving him to win Ultimate Boxxer on Friday 27th April at the Manchester Arena, he wants to keep the memory of his late brother Luke alive. The date is also significant to Isaac as it’s on the day of Luke’s birthday, which he believes is his destiny to be crowned the Ultimate Boxxer. Isaac admits he nearly hung up his gloves following Luke’s death in 2009 at just 19, but by continuing his career and becoming a champion will be a fitting tribute. “Luke stayed over at his friend’s house and he never woke up,” said Macleod. “I was devastated. We were best mates as well as brothers. I was depressed and had to take a break from boxing. I’ve never been able to forget what I saw. “I decided in the end that rather than quit boxing, I should carry on and fight for Luke’s memory. Ultimate Boxxer I pits eight undefeated welterweight fighters to go toe-to-toe in an exhilarating elimination tournament – backed by ambassadors Ricky Hatton, Anthony Crolla and Paulie Malignaggi – to win a cash prize from a pool of £50,000 – and the chance to become boxing’s newest star. Isaac believes that he will be the last man standing from the eight entrants and is likely to be the bookmaker’s favourite. The 23-year-old has an outstanding amateur pedigree having won European Youth Gold and World Youth Silver. “The others will think: ‘It’s three rounds, I have to go for broke’ and I’m just going to keep my cool and capitalise on their mistakes. This looks set to be a breakthrough year for Isaac after a frustrating start to his professional career – also a reason why Ultimate Boxxer was created to give pro fighters like Isaac, who don’t have the exposure, a golden opportunity to become a star. Trained by Darnell Smith in Essex, Isaac is the mandatory challenger for the English welterweight title. “There’s not an awful lot of pro boxing in the North East,” he said, “and I haven’t really been able to show people what I can do yet. “’Ultimate Boxxer’ is a fantastic concept and will raise my profile and then I’m looking to push on. Strengths: Slick skills and boxing IQ. He’s only 23 – but has been boxing for a long time. 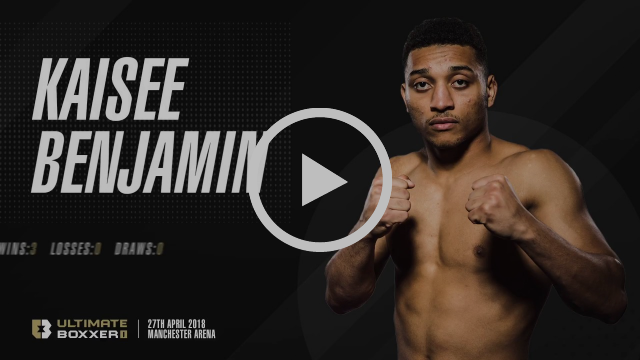 Today’s Ultimate Boxxer contender Kaisee Benjamin explains how his brains (a little beauty) and admiration for Vasyl Lomachenko will take him to crowning glory in Ultimate Boxxer. Birmingham’s Kaisee Benjamin KO’d everyone enroute to the ABA Novice final with his pro debut resulting in the same fashion. Often switching stances, Kaisee is highly unpredictable. Follow his journey @ultimateboxxer as all roads lead to the Manchester Arena on 27th April 2018.